Hypocrisy is a word that can be defined in two words, Islamic Republic. If a suicide bombing happens elsewhere, its the 'peak of consciousness', its the 'ultimate martyrdom'. The martyr who blew himself up will surely go straight to heaven unless of course the martyr blew himself up and killed revolutionary guard commanders as a result. 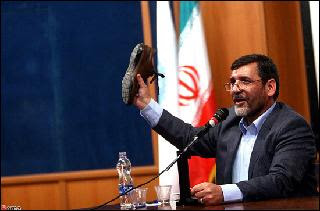 Similarly throwing a shoe at someone you don't like is good if its against the likes of Bush but if the Iranian students get fed up with the hypocrisy of the former Ahamdienjad's Guidance Minsiter and throw a shoe at him, it is uncivilised! 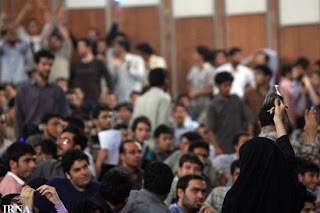 This is what happened when Ahmadienjad's former Minister of Islamic Guidance, Saffar Harandi, appeared at Tehran's Technical University and accused Moussavi of attempting to organise a coup by not accepting the election results! One of the students who could no longer take this insult against their intelligence threw her shoe at him, which didn't reach him but hit a female Baseej student on her head sitting in the front, see below as she holds the shoe asking who threw this? The Baseej student then handed the shoe to Saffar Harandi who held the shoe and said 'How uncivilised of you to do this'. How hypocritical of you to say such a thing Mr. Saffar Harandi, for you were the one who was organising shoe throwing competitions a while ago! "Hypocrisy is a word that can be defined in two words, Islamic Republic." Why do you think I am a hypocrite? Regarding IR hypocricy, I invite you to read my article: "The Rabbit's Hat: A Game of the Iranian Dictatorship"
Yes Barmakid, why are you making such connections?